Just when one thought the controversy-ridden Minister of State for External Affairs Shashi Tharoor would mount a serious, clinical defence of his alleged role in the IPL Kochi franchise, he came into the din-struck Lok Sabha smiling more than generously and playing emotional cards to clear his name of blots. Whether he succeeded, time will tell. Even as the BJP was gunning for Union Minister Shashi Tharoor issue, stalling both Houses of Parliament on the second day of the post-interval budget session, former party president Rajnath Singh seems to have thrown a spanner in works of his party’s Rajya Sabha leaders by raising the issue of wheat rotting in government godowns. This is the first time Rajnath Singh appeared before the media since he relinquished office in November last year and was accompanied on the dais by BJP general secretary Kirit Somaiya. Defence Minister A K Antony today said a Navy inquiry had established that a senior naval officer had connections with a Russian woman, but it was yet to be proved whether certain security aspects had been compromised or not. Prime Minister Manmohan Singh has set up a Group of Ministers (GoM) to go into the Judicial Standards and Accountability Bill following serious differences within the Cabinet over the proposed legislation. Will he meet Natwar Singh’s fate? In 2005, when Prime Minister Manmohan Singh was on an official visit to Russia, the oil-for-food scam involving the then external affairs minister Natwar Singh was at its peak. Shortly after his return to Delhi, the first task the PM undertook was to accept the senior minister’s resignation from the Cabinet. Following a PIL on the Gujjar agitation the state, the Rajasthan High Court today asked the state government to constitute a high-power committee led by a retired Judge to look into the Gujjars’ demand for reservation and also find a solution to the problem arising out of the ongoing stir. Pakistan cricketer Shoaib Malik’s cross-border romantic tryst may have ended on a happy note with a fairytale wedding, but the legal troubles continue to haunt him. Shoaib’s plans for an early return to Pakistan with his bride Sania Mirza have hit a hurdle as he is yet to get back his passport from the state police. The police had seized his passport on April 5 during investigations into a criminal complaint filed by a Hyderabad girl, Ayesha Siddiqui, who claimed to be his first wife. Today, both Houses saw the BJP-led opposition wrecking proceedings and seeking a Prime Ministerial clarification on his colleague’s role in using his position to secure “free undiluted equity” worth Rs 70 crore for friend Sunanda Pushkar. So vociferous was the Opposition (most MPs stormed the Well till proceedings were adjourned for Monday when the PM will be around) tirade against Tharoor that the latter, despite the smiles he wore with elan, couldn’t read his statement. He had to lay it on the table of Lok Sabha and rush to TV cameramen standing by to say his thing. So all Tharoor did — which was “nothing more than mentoring Rendezvous Sports World that won the IPL Kochi bid” — was as a “passionate cricket fan and Kerala MP, who has nurtured a desire to see the sport flourish in his home state”. “And those who know me, know that money hasn’t been a motivating factor for me. I had no role in setting up the consortium or in its business decisions. I didn’t grant any favours to members of the consortium. 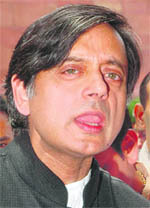 In fact my ministerial position is irrelevant to the bid,” Tharoor argued. He was gracious enough to acknowledge — without naming Pushkar — that she was a “close friend” but as a smart former international public servant, he steered the controversy in an unknown direction, insinuating that Puskhar’s criticism was due to her gender. “It is suggested that I have indirectly benefited because the Rendezvous includes a close friend of mine. This is particularly wounding…it is unworthy of MPs to imply that a reputed business professional can, because of her gender, only be seen as a front for someone else,” said the minister. Even as the BJP was gunning for Union Minister Shashi Tharoor issue, stalling both Houses of Parliament on the second day of the post-interval budget session, former party president Rajnath Singh seems to have thrown a spanner in works of his party’s Rajya Sabha leaders by raising the issue of wheat rotting in government godowns. This is the first time Rajnath Singh appeared before the media since he relinquished office in November last year and was accompanied on the dais by BJP general secretary Kirit Somaiya. Also present in the background was BJP president Nitin Gadkari’s political secretary Vinay Saharsbudhe, indicating Gadkari’s support to Rajnath’s bid to raise an issue closer to the common man. Rajnath, who was reportedly asked by Gadkari to go with Somaiya, went to two villages of Haryana, Bhagola and Allahpur in Palwal district of Haryana today. Haryana BJP president Kishanpal Singh Gujar also accompanied them. Claiming that large quantity of wheat is rotting outside FCI godowns in these villages, Rajnath alleged that more than two lakh tons of wheat is rotting in Bhagola and nearly as much at Allahpur. In the last few days, BJP had raised the pitch on Tharoor issue, seeking his dismissal from the government. In the process, party sources said, focus seemed to be shifting away from the first major public show of Gadkari in Delhi --- the price rise rally that the BJP has scheduled for April 21. This does not seem to have gone down well with sections within the party, especially those aligned to Gadkari and the RSS. l Rajya Sabha was on Friday plunged into turmoil as the Opposition wanted a full-fledged discussion on the controversy surrounding Union Minister Shashi Tharoor and the Kochi IPL team, leading to adjournment of the House for the day. l The trouble started soon after the House met for the day with the BJP demanding suspension of the Question Hour and taking up the Tharoor issue. As the protest continued, Chairman Hamid Ansari adjourned the House within few minutes upto noon. l When the House reassembled, BJP member M Venkaiah Naidu, joined by SP, AIADMK and JD(U) MPs, said that the government was not taking the concerns of the Opposition seriously on this issue. Minister of State for Parliamentary Affairs Prithviraj Chavan said that Tharoor was ready to explain his position. “Please permit him to make a statement,” he said. l Deputy Chairman K Rahman Khan said he could allow a discussion right away during Zero Hour and he could also do away with the three-minute limit for each member to speak. But this was not acceptable to the Opposition which wanted a full discussion. A decision was expected once the Navy completed its investigation, Antony said, while maintaining that the Navy was taking special care to speed up the inquiry and it would be premature on his part to jump to any conclusion. The Navy submitted its Board of Inquiry report on the episode yesterday. It began the probe after it received a set of “objectionable” photographs of the officer along with a Russian woman a week ago. Sources say even if there has been no security leak, the officer will face action for moral turpitude -- having an illicit relationship with a woman. The officer possibly did not have access to documents which can be classified sensitive, added the sources. After his Russian tenure, Commodore Singh returned to India as Principal Director of Aircraft Carrier Project before he was transferred to the Directorate General of Quality Assurance in the Capital late last year. Last month, the Cabinet Committee on Security gave its nod to sign a deal with Russia for raising the price of the carrier to $ 2.33 billion (about Rs 11,000 crore). Originally, India had purchased the 45,000-tonne warship at $974 million. Besides Law Minister M Veerappa Moily, other members of the GoM are Sharad Pawar (Agriculture), P Chidambaram (Home) and Kapil Sibal (HRD), official sources said today. The Bill, which is part of the ongoing legal reforms, is aimed at ensuring speedy disposal of cases, besides transparency and accountability in the judicial system. The draft Bill had generated a heated debate at a recent meeting of the Cabinet whose approval had been sought by the Law Ministry for moving it in Parliament. The meeting then decided to refer it to a GoM. Among the provisions, on which there was no consensus, were an inquiry procedure for looking into complaints against Judges and a 90-day deadline for delivery of judgments from the date courts reserved their orders, sources said. Also, proposed deadline for verdicts was resented by the judiciary that viewed it as an infringement on its independence. Sources said the GoM was expected to iron out differences in the shortest possible time as not only Moily but also the PM was keen on cleaning up the image of the judiciary that had come under cloud of late following a series of complaints - be it the impeachment move against Karnataka Chief Justice PD Dinakaran and Calcutta HC Judge Soumitra Sen or PF scam in Uttar Pradesh. In a striking similarity, the Prime Minister’s week-long overseas trip to the US and Brazil has been overshadowed by the Shashi Tharoor controversy which has derailed Parliament and is now threatening crucial financial business as an unrelenting opposition is pressing ahead with its demand for the junior minister’s removal from the government. With PM Manmohan Singh scheduled to reach Delhi tomorrow afternoon, the question that begs an answer is: Will history repeat itself? The jury is still out on whether Tharoor, minister of state for external affairs, will meet the same fate. Although Tharoor has given a personal explanation in the Lok Sabha today about his involvement with the Kochi IPL franchisee, his troubles are far from over as neither the government or the Congress has come out openly to defend him. “We are still evaluating and studying his explanation,” remarked a senior Congress leader, who is known for his proximity to Congress president Sonia Gandhi. UPA sources said Tharoor’s explanation and a report prepared independently by the government on this issue, will be given to Prime Minister. Distancing itself from this entire controversy, the Congress has repeatedly said a final call on this issue will be taken by the Prime Minister on his return. Tharoor has been accused of misusing his office to get sweat equity valued at Rs 70 crore for close friend Sunanda Pushkar in the Kochi IPL franchise. He has denied these allegations. “The government will take a view after checking the veracity of these charges and examining Tharoor’s defence,” said a senior UPA minister, adding that the government has collected details of the bidding process which will help in firming up its decision over the weekend before it faces the combined wrath of the opposition in Parliament on Monday. Finding itself cornered on the Tharoor issue, the government has sought to silence its critics by widening the ambit of the inquiry beyond the funding of the Kochi IPL franchisee. The income tax department has now sought details from the Indian Premier League (IPL) along with the Board of Control for Cricket in India (BCCI), which is threatening to open a can of worms. Controversial IPL commissioner Lalit Modi is being questioned while payment details of all IPL franchisees, revenue sharing arrangement between BCCI and IPL, and between IPL and other franchisees, are being sought. However, the government may not be able to go far in this exercise given the far-reaching influence of the other IPL franchisees, which includes the Ambanis and Shah Rukh Khan. More importantly, it could create problems with UPA ally, NCP leader Sharad Pawar, who is known to be close to Lalit Modi. A Division Bench of the high court asked the state government to constitute the committee under the chairmanship of a retired high court Judge and also include a bureaucrat, a social activist and a parliamentarian to look into the issue. The panel was also asked to take up the matter with the Gujjar community so as to defuse the agitation. The matter will again come up for hearing on May 3. Meanwhile, Energy Minister and state government’s intermediary on the issue Jitendra Singh said they were exploring the possibility to satisfy the Gujjars’ demand of 5 per cent quota within the constitutional limit of 50 per cent. “Our legal experts are very much on the job. They are evaluating the Rules, Acts and other legislations adopted by some southern states. It may take time to come out with a constructive formula,” he added. According to sources, the government will get a copy of the Supreme Court judgment that had upheld a decision by the Andhra Pradesh government of granting reservation above 50 per cent ceiling even though the high court had stayed it. Pakistan cricketer Shoaib Malik’s cross-border romantic tryst may have ended on a happy note with a fairytale wedding, but the legal troubles continue to haunt him. Shoaib’s plans for an early return to Pakistan with his bride Sania Mirza have hit a hurdle as he is yet to get back his passport from the state police. The police had seized his passport on April 5 during investigations into a criminal complaint filed by a Hyderabad girl, Ayesha Siddiqui, who claimed to be his first wife. Though Ayesha has since withdrawn her complaint after the cricketer divorced her, following a compromise brokered by the community elders, he will have to wait for legal formalities to be completed before the passport can be returned to him. Andhra Pradesh High Court today heard Shoaib’s petition seeking a direction to the Hyderabad Central Crime Station police to release the passport and posted the matter to Monday for further hearing. Ayesha’s counsel also submitted an affidavit to the court, stating that the criminal case filed against them had been withdrawn. Justice CV Nagarjuna Reddy, who heard the petitions, posted the case to Monday. In all probability, the court might order release of passport on Monday unless some objection is raised by the prosecution. In his petition, Malik contended that since the dispute between him and Ayesha had been resolved amicably, the police had no reason to detain his passport. Initially, a criminal case was slapped against Malik for cheating, criminal intimidation and harassment. The case was later taken up by the Central Crime Station and the passport was deposited in a local criminal court. Later, the issue was settled amicably with Shoaib agreeing to give divorce to Ayesha. However, it is not easy to close a case once an FIR has been filed in a criminal court. It is also possible that the court might refer the matter to a family court. If it is referred to a family court, the judge will have to summon both Ayesha and Shoaib to the court on the same day, ask them to make a common statement stating that they had come to a compromise.